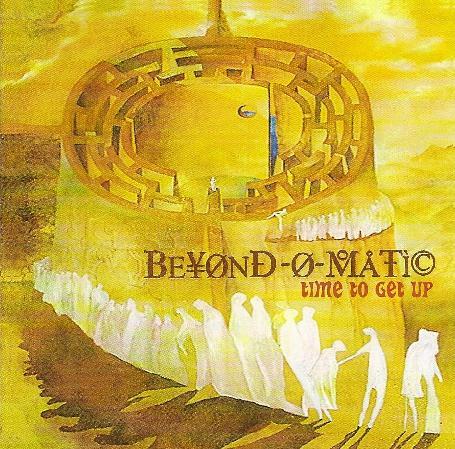 Beyond-O-Matic - "Time to Get Up"
At the time of writing this, I don't know if Beyond-O-Matic are still a performing band. They do have a new album out, but these are recordings made back in 2002/2003 and never released until now. Regardless of whether they are still together in some form or not, this is an excellent album, well worth checking out. And from what I've heard of their past albums (all excellent), this may be their masterpiece. This is the kind of transcendental music that really takes you away from the Earth and into the cosmos of outer space and the inner mind. Now don't get me wrong, this may be mellow music to chill out to, but it's not ambient or new agey. While opening with a breathtakingly beautiful slice of the cosmic pie called Plague of Bliss, with spacey synths, slow guitar and multi-layered voices, it's followed by the more upbeat and down-to-earth Hawaiian Lady. This track, clocking in at almost 15 minutes is one of the highlights of the album. Trippy, liquid synths swirl around funky guitars, electronica-style beats and lead man Peter Fuhry's falsetto vocals, like the Bee Gees on acid, before it drifts into a more serenely mellow vibe bordering on ambient without quite reaching it. Star Bong, on the other hand, combines Stenzo's prog rock-style synths with Fuhry's cosmic guitars, flute and lush vocal harmonies, all set to a slow groove for a tasty trip into the psychedelic void. The 12-minute long Trying to Find You is perhaps the heaviest piece on the album, and I don't mean that necessarily in a heavy rock sense (though there are some quite fuzzed out guitars buried in the mix), but more like it has this really heavy vibe, while still going along with the druggy, chilled out atmosphere of the rest of the album. Two drummers, David Jayne and Anthony Koutsos, rounding out the band's line up, lay down some powerful rhythms to tie the haze of sounds together for certainly the most space rock oriented piece on the album. It's followed by the more minimal and spacious slow-burner title track, which bears one of the most striking melodies on the album. Things finish off with two shorter pieces, the brief Liquid Midnight, an almost entirely vocal number and the dreamy and melodic space folk/pop of Child of Fog. The tunes are sequenced to produce an ebb and flow effect that allows the listener to ride along on Beyond-O-Matic's cosmic wave, on a journey into the vast and beautiful unknown. This will be one of my top albums of the year and comes highly recommended!